Preheat oven to 350 degrees F. Grease and flour 9x5-inch loaf pan. Sift together flour, salt and baking soda and set aside. In a mixing bowl, cream together the butter and brown sugar until light and fluffy. Add eggs one at a time and stir in the mashed banana. Combine milk and lemon juice and add to the butter and egg mixture, alternating with the flour mixture. Stir in walnuts. Spoon batter into pan. Bake for 50 minutes or until a toothpick inserted near the center comes out clean. Cool before slicing. 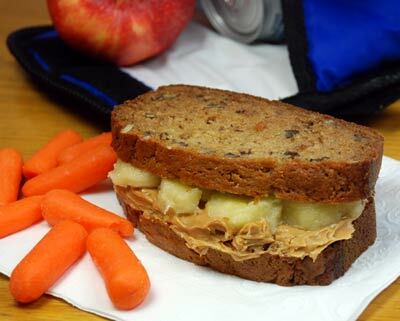 Spread peanut butter on one slice of banana bread. Top with slightly overlapping banana slices. Top with second slice of banana bread.